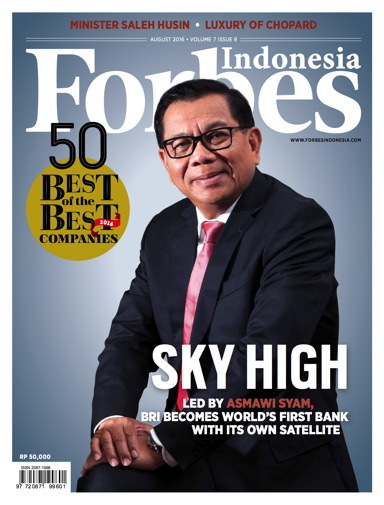 The ambitions of Bank Rakyat Indonesia (BRI) are sky high. The bank has a tradition of being a pioneer, first in the area of microfinance. One study by the World Bank said BRI was “one of the most successful microfinance institutions in the world.” The bank’s extensive microfinance program has, over the decades, made a powerful and positive impact on the lives of millions of the poorest of the poor. Collectively, the bank’s microfinance has contributed to the country’s long-term development. Now under President Director Asmawi Syam, the bank is becoming a pioneer once again. From distributing the smallest of loans, the bank has shifted in the opposite direction, with a huge $250 million project. In July, BRI became the first bank in the world to have its own dedicated satellite. It would be easy to dismiss this satellite as an expensive gimmick—but it is much more than that, as it represents a potential game changer for the bank. Just as it turned microfinance into a major success, Amawi wants the satellite, dubbed BRIsat, to give the bank a huge, and unique, edge in its competition with its rivals.